Amazon Studios has set a May 11, 2018 release date for the dramatic film Don’t Worry, He Won’t Get Far on Foot. 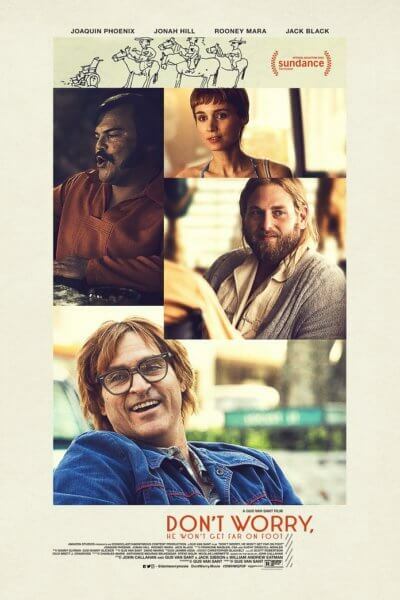 In addition to announcing the theatrical release date, the studio debuted the first official teaser trailer and poster for the screen adaptation of John Callahan’s autobiography. John Callahan was a popular cartoonist whose work appeared in the San Francisco Chronicle, the New York Daily News, The London Observer, the Los Angeles Times, as well as more than 50+ other publications. Callahan was injured in a car accident at age 21 (it involved alcohol, but he wasn’t the driver) and that left him a quadriplegic. Following the accident, Callahan turned to art and began creating cartoons which were filled with macabre images and dark humor. After a nearly three-decade career as a cartoonist, John Callahan passed away at the age of 59. Gus Van Sant directs and Joaquin Phoenix stars as John Callahan. The cast also includes Jonah Hill, Rooney Mara, Jack Black, Carrie Brownstein, Beth Ditto, and Kim Gordon. Prior to its theatrical run, Don’t Worry, He Won’t Get Far On Foot will make its world premiere at the 2018 Sundance Film Festival. The Don’t Worry, He Won’t Get Far On Foot Plot: After Portland slacker John Callahan (Joaquin Phoenix) nearly loses his life in a car accident, the last thing he intends to do is give up drinking. But when he reluctantly enters treatment – with encouragement from his girlfriend (Rooney Mara) and a charismatic sponsor (Jonah Hill) – Callahan discovers a gift for drawing edgy, irreverent newspaper cartoons that develop a national following and grant him a new lease on life.